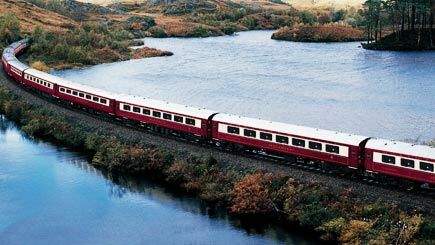 Stepping aboard the Vintage Belle Luxury Train is to be transported back in time. Plush fabrics, elegant decor and handcrafted murals conjure the opulence of elite 1920s and 1930s travel. 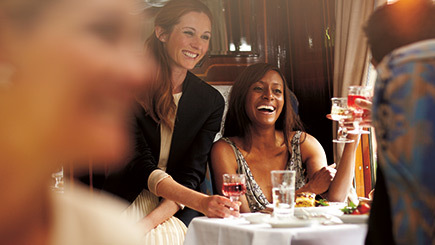 On this unmatched round trip, begin with a welcome champagne reception and be seated at a table by liveried stewards. A sensational five-course lunch or dinner is served, courtesy of Head Chef Richie Cunningham. Indulge in a British seasonal table d'hote menu including a Great British cheese board, bottle of wine to share and gorgeous petits fours. Admire the countryside vistas through the picture windows and be entertained by strolling musicians and a fabulous table magician. A celebration of fine treats and luxurious surroundings, this is the complete package. Selected Sundays. We recommend booking very far in advance to avoid disappointment. Minimum age is 16. If a vegetarian meal is required, please let us know at point of booking. Smoking is not permitted on board. Only folding wheelchairs can be stored on board and some mobility is required on the train. The weather should not affect the experience, however please note that the train runs on the public rail network and is subject to any imposed delays (although this is one train that no-one minds being delayed on). The trip lasts between four to five hours. Receive tickets, confirmation of departure times and a full itinerary by post shortly before the departure date. Up to 42 passengers share a carriage. Seating is most often within a table of four and tables of two are limited. Guarantee a table of two at the time of activation with a small supplement to the supplier. All seating is allocated at time of booking. Smart daywear is appropriate; please do not wear jeans or trainers. Valid only for dates in the schedule that match value of voucher. 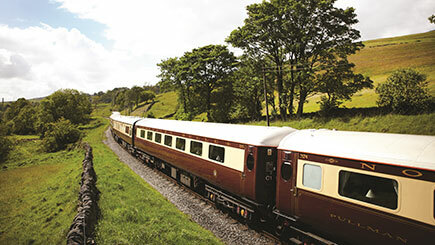 Valid on Great British Sunday Lunch, Spirit of Travel and Brief Encounter Lunches. At times a small supplement may be required to upgrade to Valentines, Mothers Day, Christmas lunch.